Posted February 16, 2018 – It is around Valentine’s Day and love is in the air. 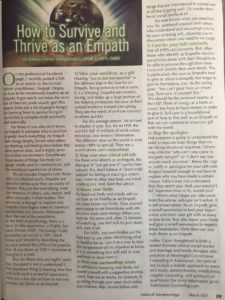 Here is an article for all of the lovers out there, even the ones who are already married. 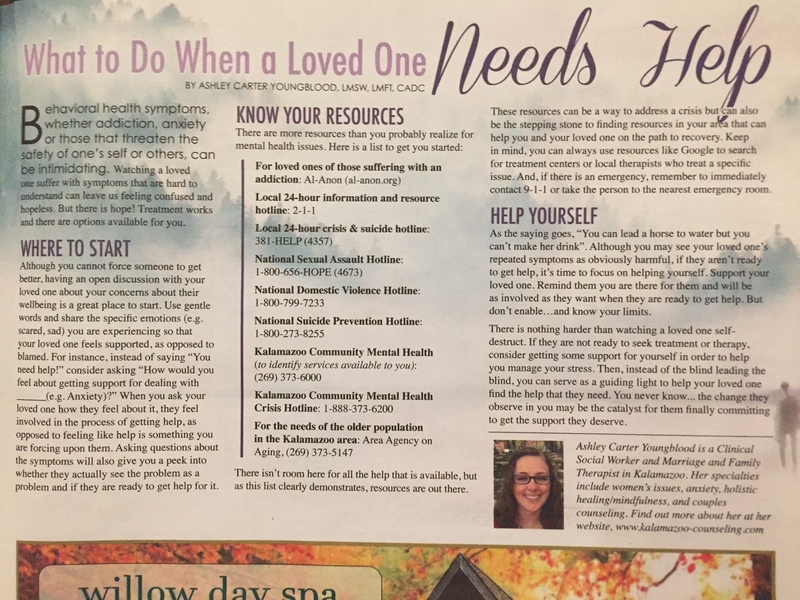 Thanks to The Greater Kalamazoo’s Women’s Lifestyle Magazine February 2018 edition, we can spread the love. Click here to learn how to prepare for marriage. 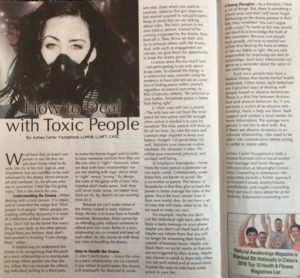 Posted February 16, 2018 – Thanks to Natural Awakenings magazine for the features in this month’s magazine! 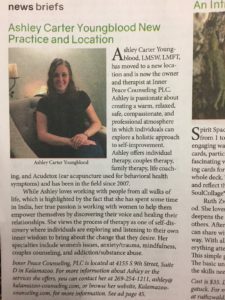 Posted January 31, 2018 – Effective immediately: After much consideration, to make way for some bigger and better things coming down the bend, I will no longer be hosting monthly meditation groups at my office. 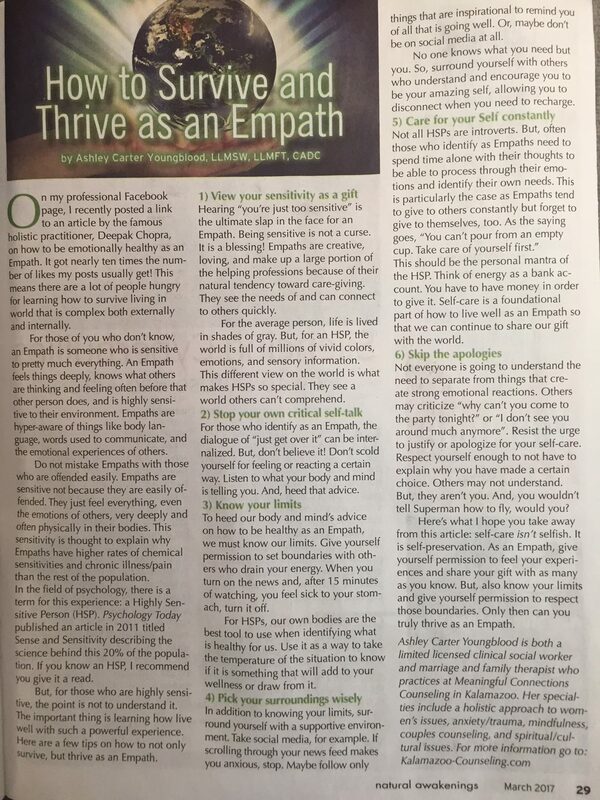 If you are still interesting in learning more about mindfulness and meditation, look for my upcoming two-part article on the topic in the Natural Awakenings magazine or contact me for other local resources to deepen your practice. Thanks for sharing space with me. May your awareness only continue to grow! Posted December 4, 2017 – Not sure to do when a loved one needs help? You are not alone. 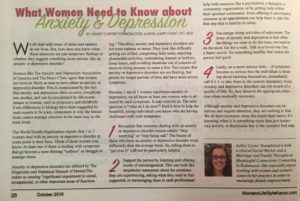 Hopefully this article, found in The Greater Kalamazoo’s Women’s Lifestyle Magazine November 2017 edition, can offer some guidance! Here is a link to the content. 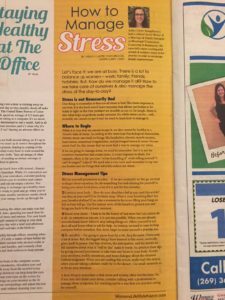 Posted December 4, 2017 – Stressed? Sure! We all are! 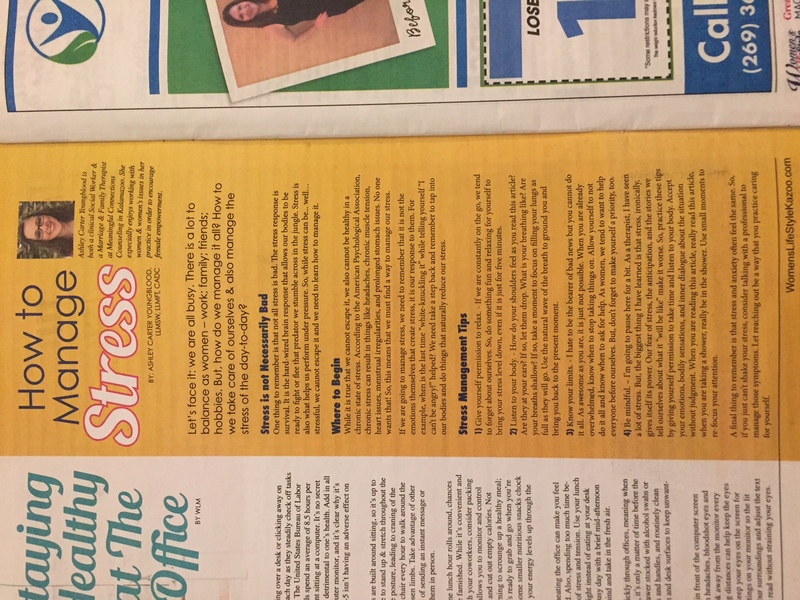 Here is an article with some tips on how to manage that stress that we can never full escape. 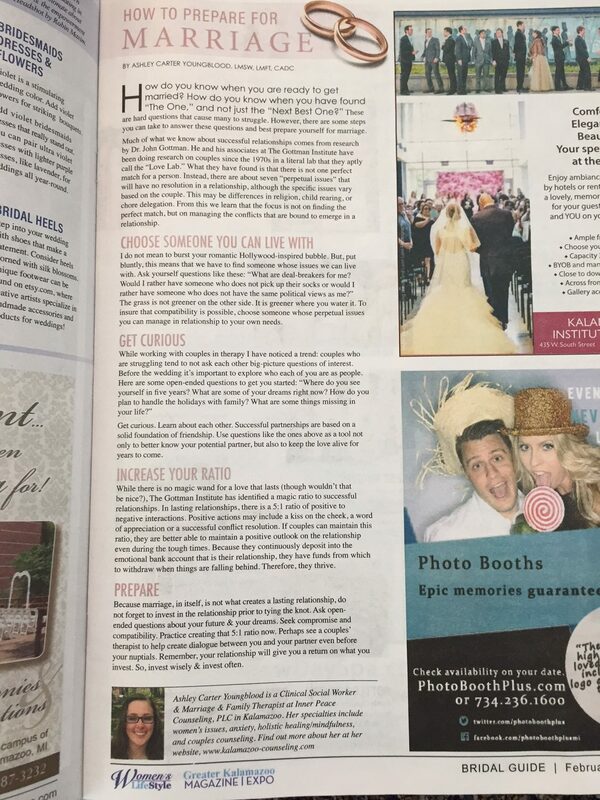 Thanks to the The Greater Kalamazoo’s Women’s Lifestyle Magazine for the publication in the September issue! Here is a link to the content. Posted December 1, 2017 – Due to illness, I will not be hosting the free meditation group at my office tomorrow. But, we should be back at normal starting in January. I hope to see you then. Posted November 16, 2017 – Thanks to News Channel 3/WWMT for the mention! Let’s keep using our voices (and bodies when we need to) to defend. And, look for some exciting opportunities to learn how to heal and defend. There are some important things in the works! So, stay tuned. ANNOUNCING A RELOCATION AND CHANGE IN CONTACT INFORMATION! 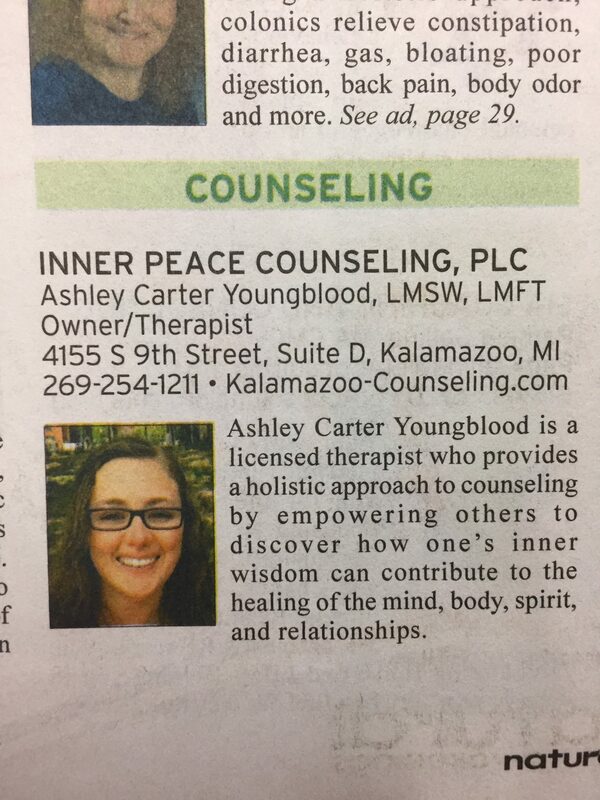 I am excited to announce that I am transitioning into solo practice under the name “Inner Peace Counseling, PLC” and will be working from a new location. This change will be official on Monday, November 27, 2017. My new address, only 5 minutes away from my current location, is: 4155 S 9th Street, Suite D Kalamazoo, MI 49009. My updated solo practice phone number is 269-254-1211. My new secured fax number is 1-844-965-9223. 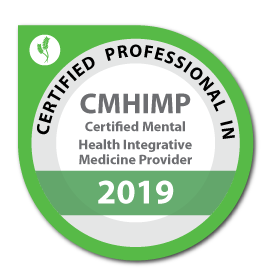 While all other professional contact information will stay the same, I am also now fully-licensed as both a Clinical Social Worker and a Marriage and Family Therapist. I will still be accepting Blue Cross, Blue Shield, MESSA, and Blue Cross Blue Shield Insurance; self-pay or sliding-fee scale reimbursement, as well as being able to bill Out of Network for those with other insurance plans (e.g. McLaren Medicaid, United). Over time, I also will continue adding new insurances to the list of those that I can accept, including Blue Care Network. I encourage you to follow me on my professional Facebook page, https://www.facebook.com/ACarterYoungblood for continued updates, photos, and directions! I am eager explore the level of intimate quality of care that being a solo practitioner allows. And, I look forward to continuing to grow with and for you in order to continue to serve you even better. Please contact me with any questions or for more information. Thank you for your support. I can’t do what I do without wonderful people like you! On Saturday, September 30th and Sunday, October 1st – Join me at ArtPrize 2017 at The BOB with professional face and body painter, Kristen Adams (vote code 66289), to see some beautiful body art and to hear more about community resources and steps to recovering from trauma and tragedy. Recovery is possible! Let’s break those stigmas! Posted November 1, 2017 – Do you feel like or have you been told that you are your worst critic? 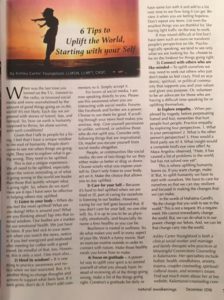 The Natural Awakenings magazine, November 2017 edition, has some tips from yours truly. 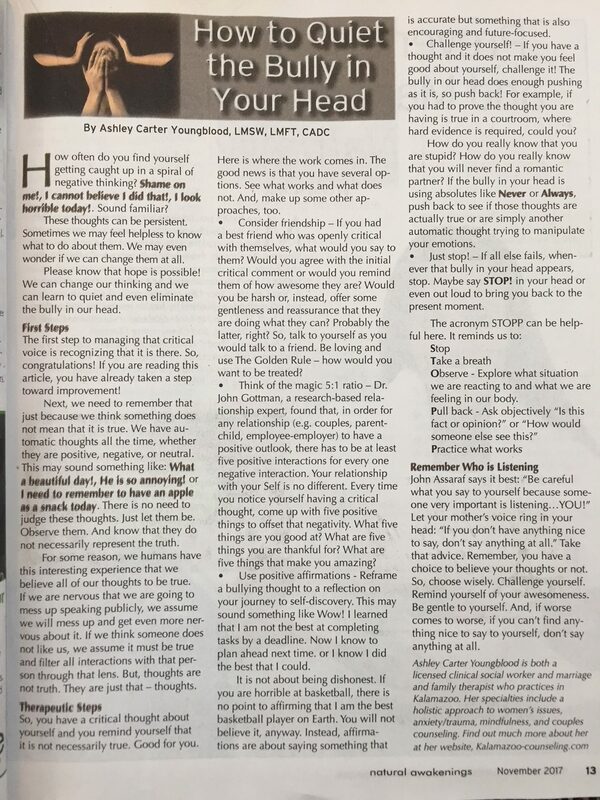 Learn how to quiet the bully in your head and start thinking positive today by checking out this article. I am being featured as a Clinical Consultant to an ArtPrize 2017 project, “Healing through Body Art.” I am partnering with Kristen Adams, an amazing local professional face and body painter, who is doing live body paintings illustrating the resilience of those who have been through and are healing from trauma. Given that Grand Rapid’s ArtPrize is one of the biggest art competitions around, partnering with Kristen Adams is truly an honor! The live body paintings can be observed from September 20th through October 8th and yours truly will be on location on September 30th and 31st to offer support and resources to those who have questions or are looking to also recover from tragedy. In her piece, Kristen is illustrating stories of recovery from anorexia, PTSD, drug abuse, domestic violence, sexual abuse, living as a transgender person, and others. She is also looking to fill 4 more slots for volunteers who want to tell their stories through art: on October 3rd, 4th, 5th, and 6th. Please contact her if you are interested in sharing your story. It is our hope that this project will raise awareness to taboo issues that are not usually talked about. Please call, text, or email Kristen at (269) 501-1451 or kfxbodyart@yahoo.com. Stay tuned for a T.V. interview on this topic and other exciting updates! Posted August 9, 2017 – Are you starting to feel a bit down realizing that summer is almost over. The “Winter Blues” is a real thing and it’s treatable. 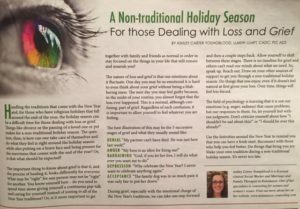 Check out this article in the August 2017 edition of The Greater Kalamazoo’s Women’s Lifestyle Magazine to help guide you through the upcoming seasons. Here is a link to the content. 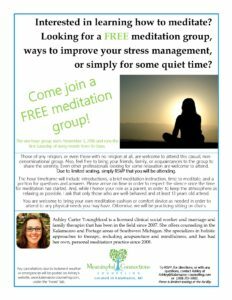 Posted July 28, 2017 – Notice regarding the monthly free meditation group: Due to being out of town in August and October, the meditation groups will be held on the second (instead of the first) Saturday of those months. The location and times remain the same. So, I hope to see you on Saturday, August 12th and Saturday, October 14th. Stay mindful! Published July 1, 2017 – Thanks to Natural Awakening’s Magazine for publishing my article on how to deal with toxic people. 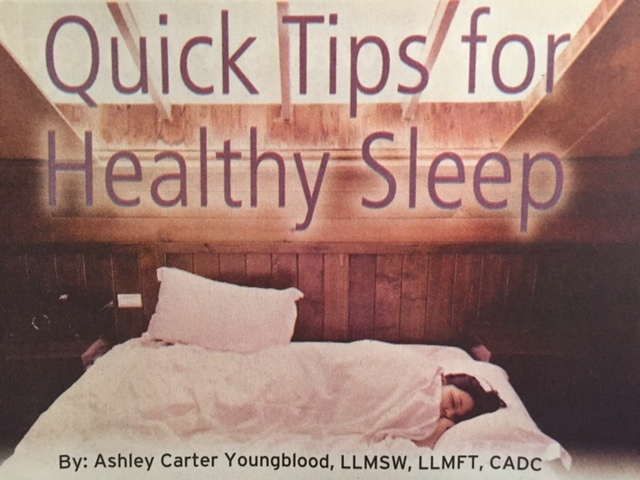 Hopefully it helps to provide helpful tips on how to breathe a bit easier. You can find the content of this article here. 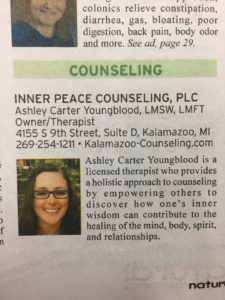 May 29, 2017 – Starting today, you can find me at my new office location, 6963 West KL Avenue in Kalamazoo, Michigan 49009. You can find more information here. April 18, 2017 – Due to my pending location to my shiny new office, May’s meditation group will be cancelled. Here is an updated flyer so that you can keep in touch. We should be back on schedule in June! Watch here or my Facebook page for more updates. 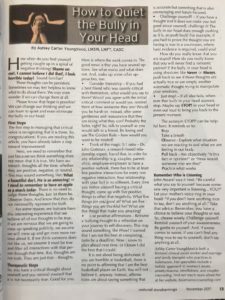 Published February 24, 2017 – Thanks to Natural Awakening’s Magazine for publishing my article on how to live as an Empath successfully. I’m hoping it touches the lives of all those reading! You can find the content of this article here. 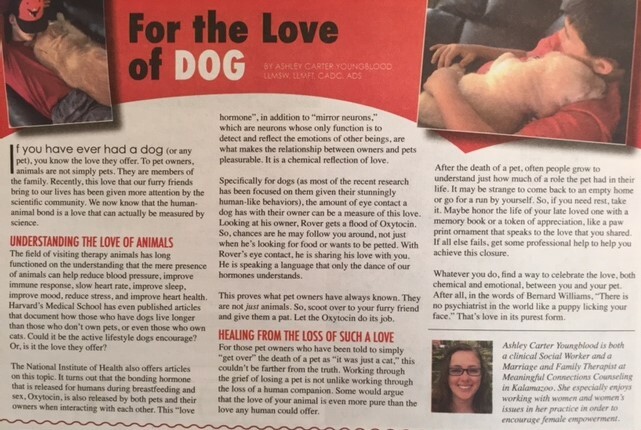 Published February 1, 2017 – Interested in knowing more about the human-animal bond? 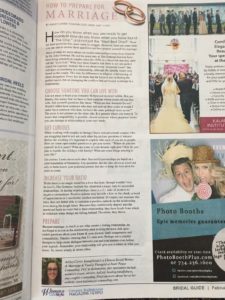 Here’s an article from the Greater Kalamazoo Area Women’s Lifestyle Magazine that tells you all about it. You can find the content in the February 2017 edition or here, on my blog. Enjoy! 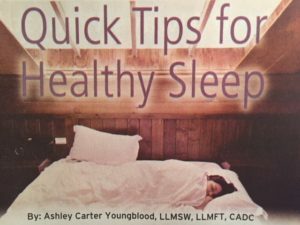 Published December 27, 2016 – Thanks to the amazing Natural Awakenings Magazine for publishing my article, “Quick Tips for Healthy Sleep” in your January 2017 edition. Click here to read the content of my article. 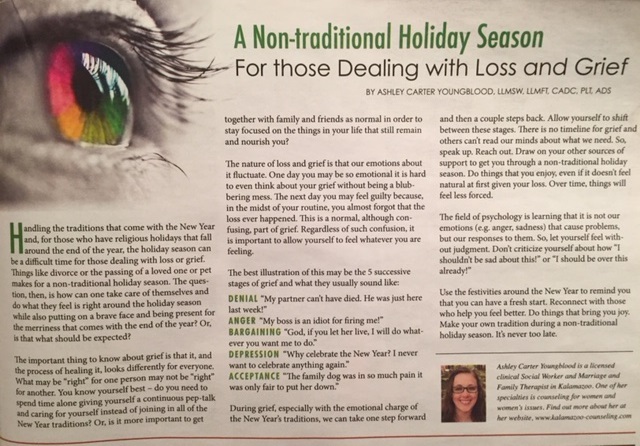 Published December 2, 2016 – Thank you to The Greater Kalamazoo’s Women’s Lifestyle Magazine for spreading the word on how to cope with a non-traditional holiday season. Here is a link to the content. 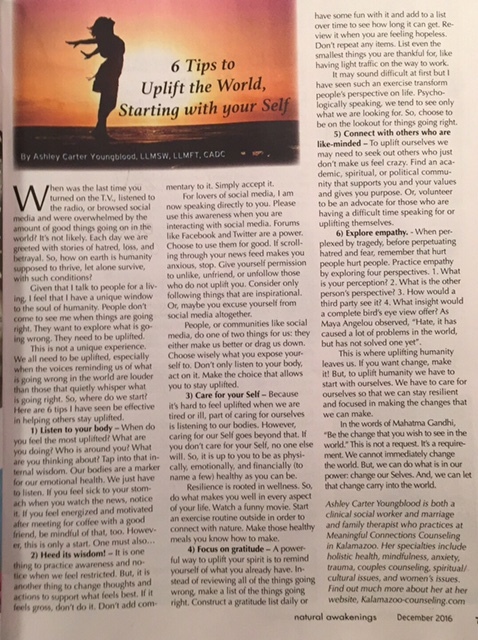 Published November 22, 2016 – Thanks, Natural Awakenings Magazine, for publishing my article in your December edition. Click here to read the content of my article. Mindfulness and meditation are becoming popular concepts related to the way they can help us manage our stress and improve our mental health. Are you interested in learning how to meditate? 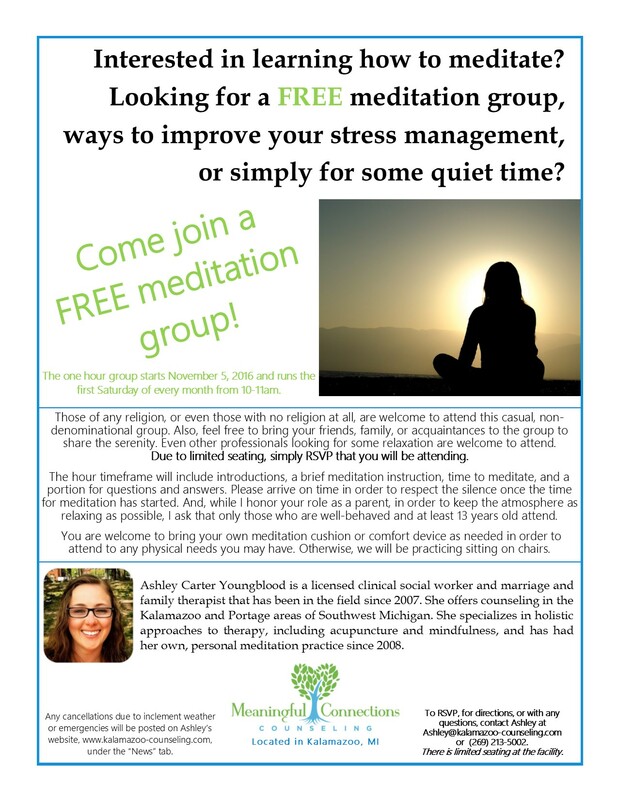 Are you looking for a FREE meditation group, ways to improve your stress management, or simply for some quiet time? If so, come join me for a FREE monthly meditation group every first Saturday of the month from 10-11am at my office. Seating is limited, so please remember to RSVP. But, bring whomever you want. The more the merrier! 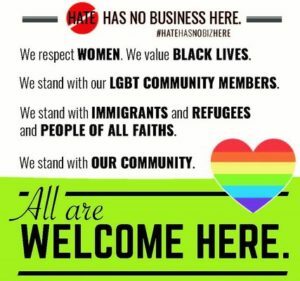 Those of any religion, or even those with no religion at all, are welcome to attend this casual, nondenominational group. Also, feel free to bring your friends, family, or acquaintances to the group to share the serenity. Even other professionals looking for some relaxation are welcome to attend. The hour timeframe will include introductions, a brief meditation instruction, time to meditate, and a portion for questions and answers. Please arrive on time in order to respect the silence once the time for meditation has started. And, while I honor your role as a parent, in order to keep the atmosphere as relaxing as possible, I ask that only those who are well-behaved and at least 13 years old attend. You are welcome to bring your own meditation cushion or comfort device as needed in order to attend to any physical needs you may have. Otherwise, we will be practicing sitting on chairs. Click to here to view or download the flyer. Feel free to share with or distribute it to whoever you want! This information is also available on my Facebook page. Thanks to Western Michigan University’s Teaching Assistants Union for hosting me for such an esteemed panel. 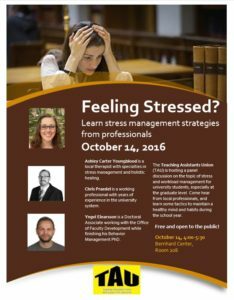 It was a pleasure to talk about the important topic of stress management. 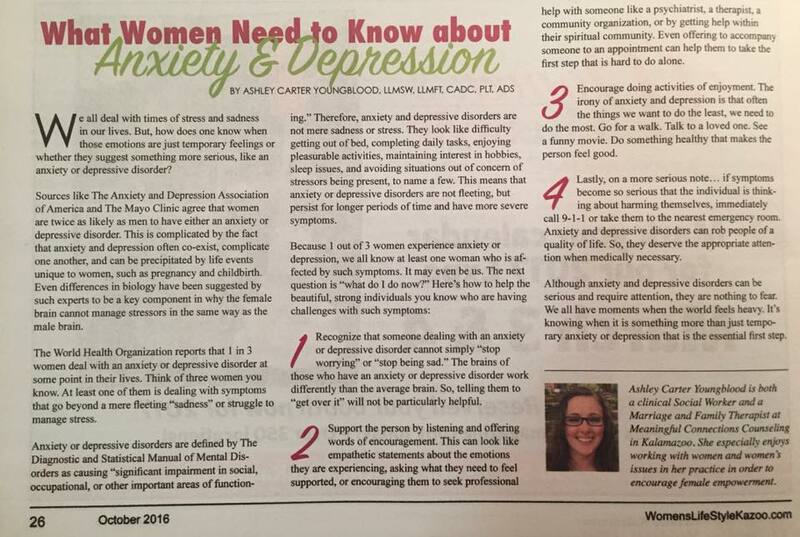 Thanks, Women’s Lifestyle Magazine, for publishing my article about “What Women Need to Know about Anxiety and Depression”, in your October 2016 edition! Find the content on the article here, on my blog.